What are Thyroid Hormone Blood Tests? Hypothyroid medications are not all created equal. 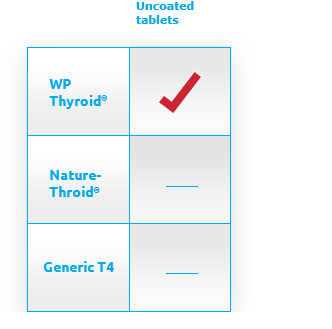 Nature-Throid and WP Thyroid have been trusted for more than 80 years by physicians and patients alike, but they have their differences. Compare the two and talk to your doctor to figure out if natural thyroid replacement medications are right for you. WP Thyroid and Nature-Throid Tablets ARE PRESCRIPTION MEDICATIONS. You are encouraged to report negative side effects of prescription drugs to the FDA. Visit www.fda.gov/medwatch or call 1-800-FDA-1088. WP Thyroid and Nature-Throid are medications and only available through a doctor prescription. Pills are not shown at actual size. Health-Related Content Disclaimer: Any information provided on this website is for informational purposes only. Health-related topics found on this website should not be used for diagnosing purposes or be substituted for medical advice. As with any new or ongoing treatment, always consult your professional healthcare provider before beginning any new treatment. If you have any concerns about your health, please contact your healthcare provider. RLC Labs assumes no responsibility or liability for any consequence resulting directly or indirectly for any action or inaction you take based on or made in reliance on the information, services, or material on or linked to this website. 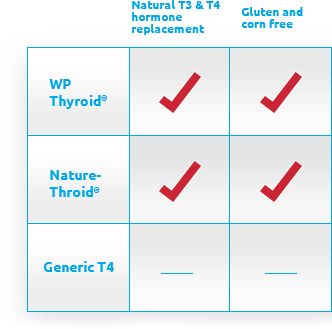 WP Thyroid® and Nature-Throid® are thyroid replacement medications, containing standardized (T4) and (T3) hormones, used to treat hypothyroidism naturally; except in cases of temporary hypothyroidism, which is usually associated with an inflammation of the thyroid gland (thyroiditis). Thyroid replacement medication needs to be taken as prescribed by your physician and is typically taken for life. Do not take WP Thyroid® or Nature-Throid® either alone or in combination with other medicines for the treatment of obesity or weight loss. In patients with normal thyroid levels, doses of WP Thyroid® or Nature-Throid® within the typical range used for hormone replacement are not effective for weight loss. Larger doses may result in serious or even life-threatening effects, especially when used in combination with certain other drugs used to reduce appetite. Too much thyroid hormone may result in a hyperthyroid state. 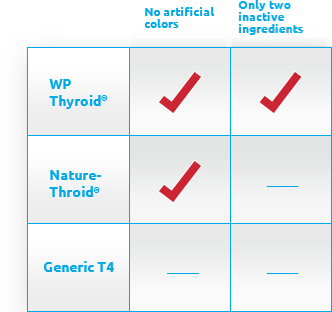 WP Thyroid® and Nature-Throid® Tablets ARE PRESCRIPTION MEDICATIONS. You are encouraged to report negative side effects of prescription drugs to the FDA. Visit www.fda.gov/medwatch or call 1-800-FDA-1088.